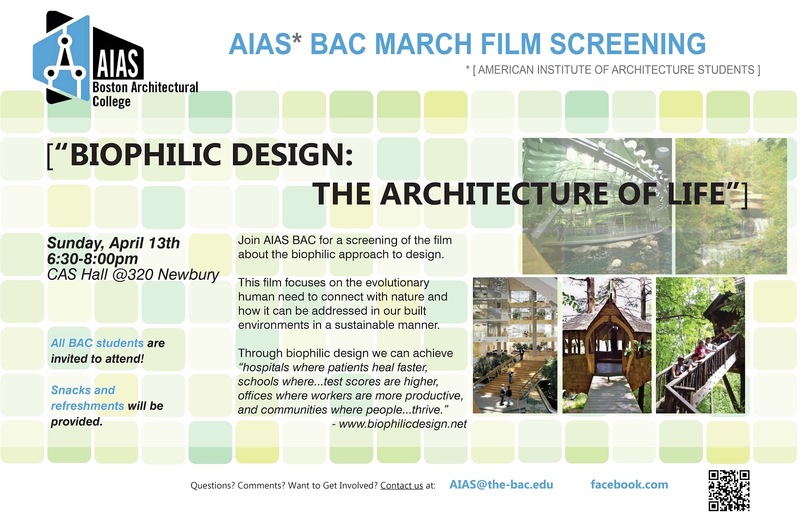 Join AIAS BAC for a screening of the film Biophilic Design: The Architecture of Life about the biophilic approach to design this Sunday. According to the Merriam-Webster definition, biophilia is the theoretical human tendency to interact and associate with other forms of life in nature, or simply love of life. This film focuses on the evolutionary human need to connect with nature and how it can be addressed in our built environments in a sustainable manner. This screening is open to all BAC students. Just bring yourself and AIAS will bring the popcorn and refreshments!